The interior made of light oak, with BORA BORA upholstery, makes it very comfy and confortable. This Dufour 335 is close to new so there is absolutely no reason to buy new. She has never ever been chartered. Only one owner, extremely well maintained. The only thing that is not close to new is the cockpit table, nevertheless, her condition is more than acceptable. _Téflon main sail track which make it very easy to raise the main sail. _Extension canvas between the Bimini and the sprayhood. 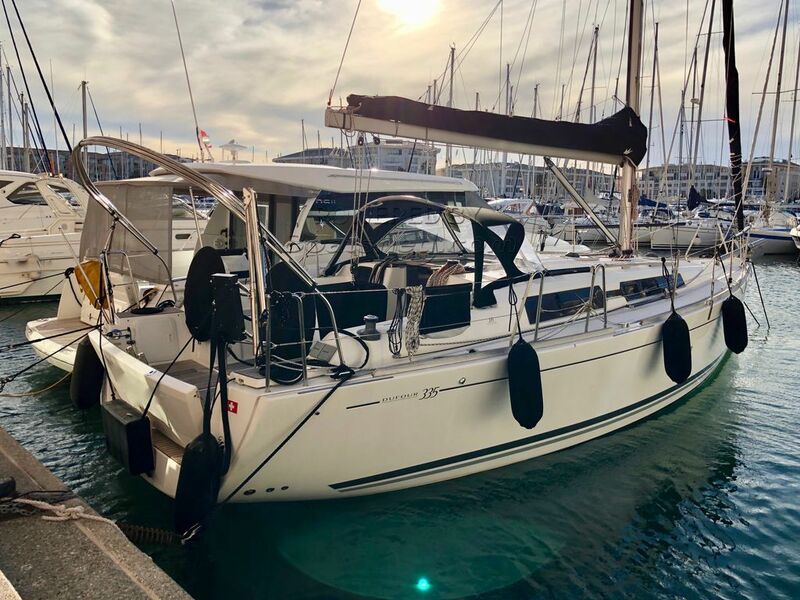 This Dufour 335 2 Cabin Version has been personally photographed and viewed by Antoine Perrin Daragon of Boatshed Riviera. Click here for contact details.